Things aren’t so golden in the “Golden State” these days. The majestic beauty of California, my home state, is eclipsed by shades of brownish-green. This is drought country. The signs you see entering the Golden State should be changed to steady visitors for the stark reality of the 50 shades of brownish-green they will see on this droughted landscaped. 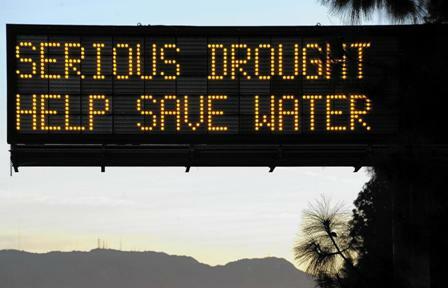 The lack of water is serious business in California and we have to conserve it. 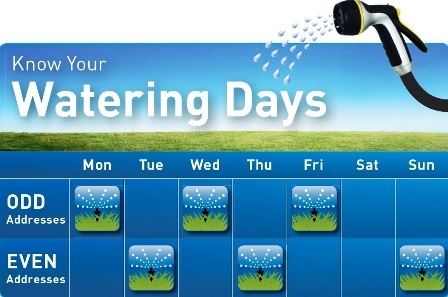 Governor Brown has ordered many water usage restrictions from a ban on grass at newly constructed commercial, industrial and government buildings, to how many days I can water my home lawn each week. Don’t comply, and you could be subject to a minimum daily fine of $500. Speaking of fines, “Magnum, P.I.” and “Blue Bloods” star Tom Selleck’s recently agreed to pay the California water district $21,685.55 to settle a lawsuit that accused him of stealing water for his 60-acre Southern California ranch. If you live in California, brown is the new green. 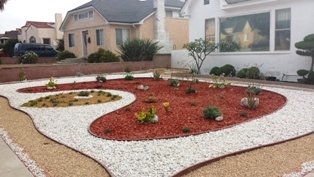 Many landscaping companies are seeing a lot of green in helping drought distraught residents create some of the most interesting and aesthetically beautiful, drought resistant landscapes which I’ve always admired when visiting Nevada and Arizona. So goes drought resistant landscapes – so goes moi because changing my landscape in definitely in my future. In California, agriculture uses 80% of the state’s water to produce the foods we love to eat. A few months ago the Los Angeles Times ran a story on their site detailing how much water it took to produce some of those foods. As you would imagine, it takes more water to produce one ounce of beef (106.3 gallons) than an ounce of squash (1.92 gallons). As a general rule protein, processed foods and starches require more water to produce; fresh vegetables require considerably less. 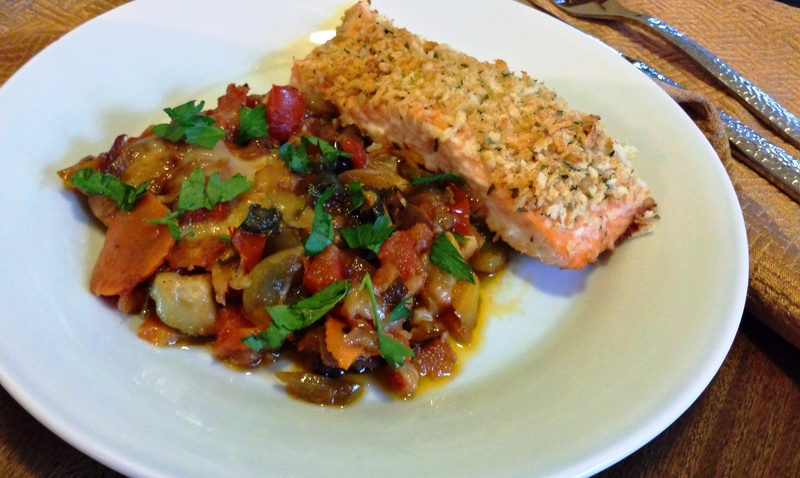 As a nod to the Golden State during this brownish-green moment in our history, I’ve created a drought friendly baked ratatouille recipe which is a bit of a departure from the traditional French stew. I bake it in a 13 x 9 inch casserole pan. 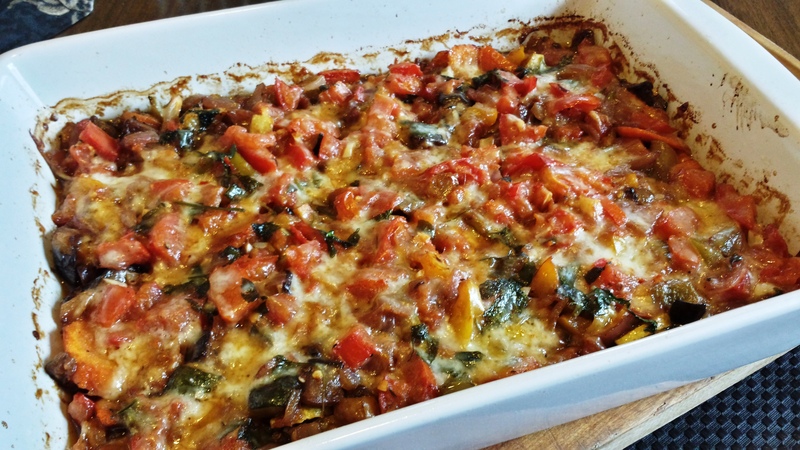 I also give it a surprising twist with the addition of anchovies, Cajun seasoning and mozzarella cheese which makes this ratatouille delicately complex. It’s a delicious side dish, and it’s hearty enough to be your only entree. It’s a great recipe to add to your culinary repertoire whether you live in drought country or not. Heat 2 teaspoons of oil in a non-stick skillet over medium heat. Add zucchini and squash and sauté until medium brown stirring occasionally, about 8 to 10 minutes. Remove from heat and spread into a 13 x 9 inch baking dish. Lightly sprinkle with salt. Add two teaspoons of oil to skillet; add eggplant and onions and sauté until medium brown stirring occasionally, about 8 minutes. Remove from heat and add to 13 x 9 inch baking dish. Lightly sprinkle with salt. Add two more teaspoons of oil to skillet; add carrots sauté until medium brown stirring occasionally, about 5 to 7 minutes. Remove from heat and add to 13 x 9 inch baking dish. Lightly sprinkle with salt. Add two final teaspoons of oil to skillet, drained anchovies and chopped garlic. Sauté about 5 minutes, stirring constantly until anchovies are dissolved. Add chopped tomatoes, cracked pepper, Cajun seasoning, and crushed red pepper and sauté 5 minutes. Fold in fresh herbs (parsley or basil). Remove from heat and add to 13 x 9 inch baking dish. Top mixture with 1 cup of mozzarella cheese. This entry was posted in Foodies and tagged Alaskan Panko and Herb Crusted Salmon, anchovies, Arizona, Blue Bloods, Cajun Seasoning, California, carrots, Casserole, caviar, cheese, collard green, collard greens, Comfort Food, cooking, dinner, drought, eggplant, epicurean, food, French stew, garlic, Golden State, Governor Brown, Grapeseed oil, greens, landscaping, Los Angeles, Magnum, mozzarella, mozzarella cheese, Nevada, P.I., panko, plum tomatoes, ratatouille, root vegetables, salmon, Tom Selleck, tomatoes, zuchinni. Bookmark the permalink.